Hermeneutics, performance art, and shamanism. Plus a journey into the style of “fusion” music which took shape in the 1970s, including a video interview with Mahavishnu John McLaughlin. In Part 1, I began discussing hermeneutics as a theory of art — not a dry theory, but something helpful and practical. I hope you had fun watching the different videos; and while the emphasis was on fun, the point is that hermeneutics is concerned with helping us understand art, finding ways to overcome the historical and cultural boundaries we may face when trying to comprehend art from another time or culture, or art partaking of such far-flung influences. To summarize from Part 1: Hermeneutics looks on art as something that we like because it’s a part of our lives and a part of human civilization. We understand it by connecting with it and asking good questions. We try not to abuse art by approaching it with a wrong understanding or no understanding at all. If we don’t understand it, an honest question to ask is: have we engaged with it and taken in those things which are helpful to understanding? Or are we standing coldly aloof from it, and does this create a barrier to understanding? The word “hermeneutics” also comes up in discussions of performance art, and performance artists are sometimes called “hermeneutists.” This might seem puzzling until we learn that in Greek mythology, Hermes was the son of Zeus and the messenger of the gods. The gods don’t speak directly to human beings, so Hermes acts as their interpreter. This makes Hermes the patron saint of hermeneutics (notwithstanding his lack of quaint parades in third world countries). According to this line of thought, performance artists are interpreters of the culture in which they live, or perhaps all of human civilization. They’re seen as living messengers (though of what, it’s not always exactly clear). So how does shamanism enter the picture? (“By the back door,” would be one clever retort.) From a modern secular point of view (which I don’t happen to embrace), shamans might be said to perform incomprehensible rituals which have a theatrical component (like performance artists), and which are intended to transform them and their audience (or participants in the shamanic ritual). Not necessarily. Think of it more as conceptual mapping between two different traditions. Perhaps in a largely secular period and region (such as Western Europe at the start of the twenty-first century), performance art acts as a substitute for certain types of shamanic rituals, without genuinely approximating them, and without necessarily understanding what the original rituals entailed or signified. As I see it, the shamanic tradition involves performing rituals which have some definite supernatural effect, such as putting the shaman or participants in contact with a supernatural force or entity, an altered state of consciousness, or a healing power (whether conceived of as internal or external). Most modern performance artists, on the other hand, strike me as engaged in a type of secular theatre which may imitate (or perhaps ape) the outer trappings of shamanism, but which neither intends to have (nor succeeeds in having) a supernatural effect. Rather, the effect is social, political, aesthetic, or psychological. The proliferation of performance in museums has a lot to do with both art itself and the changing role of these institutions, as well as the demands of an audience that wants to feel empowered, engaged and participatory. Today’s spectators demand a role, whether they are inventing their own performances in the gallery … or clamouring to take part in artist-led workshops such as the Hayward Gallery’s ongoing Wide Open School. We want to be active, rather than passive spectators. Perhaps this is merely fashion, but I suspect not. … Private rituals and public acts, catharsis and confrontation are the central strands of art as performance. The work is the beginning of a dialogue, not an end. It is something shared. We are all performers, even when we are playing at being spectators. Ritual plays an important part in human civilization, human psychology. With the rise of secularism and the corresponding decline in faith-based communal rituals, people are looking to artists to provide them with rituals they can join in, but not believe in — or at least, where no particular beliefs are prerequisites for participation. I’ve had lively discussions with Buddhists who claim that Buddhism is not a religion and requires no beliefs. I won’t recapitulate that argument in full, but some American Buddhists are refugees from strict Christian (or other) upbringings. Their particular style of Buddhism has a lot to do with rebellion, and rejection of beliefs they were force-fed. This is less true of Buddhism as practiced historically in India, China, Japan, Thailand, and Tibet. A distinct feature of some American Buddhism is its connection to American counterculture and rejection of formal requirements, its nonconformist, roll-your-own quality. So, if there are differences between traditional Buddhism and modern American variants, can there also be differences between the shamanic tradition and the type of shamanism which Western performance art is said to emulate or ape? Perhaps bad performance art = faux shamanism. There’s a saying in science fiction circles that alien tech is indistinguishable from magic (a variation on Clarke’s Third Law). Likewise, for people who don’t believe in the existence of God, gods, avatars, angels, spirits, or higher consciousness, performance art may be indistinguishable from shamanism, despite their seeming differences. I think the underyling fallacy is that by imitating the outer form of something, the artist has captured its essence. In the 1986 film Saving Grace, British actor Tom Conti does a superb job of portraying the Pope, but that doesn’t mean he embodies all that the Pope is (or can be) in real life. For that he would probably need years of spiritual training, as well as a sense of calling or vocation. There’s a darker side to some performance art involving self-harm, cutting, and so forth. This sub-genre creates a public spectacle of blood and pain, and is justified by theories concerning primitive cultures, endorphin production, and whatnot. The mere fact that an act is performed as ritual does not sanctify it. I think this type of performance art tends, whether consciously or unconsciously, to evoke the demonic, and does not have a truly healing spirit. This is not to condemn all performance art or minimize its value, but simply to ask tough questions about what it is or claims to be. Those who have rejected (or never studied) rituals of light may be drawn to rituals of darkness. Any intense communal experience, even one involving violence and pain, may be mistaken for the spiritual. Indeed, one of the challenges of our postmodern world is that the meaning tends to slip off words like “spiritual,” so that almost anything might be defined as spiritual according to the experience and predilections of the individual. I’m an arts person, certainly not a political conservative, so my point here is not to rant about peculiar notions found in postmodernity. I’m trying to slowly lay the predicate for understanding how a particular scholar, Dr. Shrinivas Tilak, connects performance art as it exists today with the poet-seer or “kavi” of ancient India, who may be viewed as an authentic shaman within the Vedic tradition. If performance art sometimes consists of artists imitating shamanic rituals, how would this differ from shamans practicing performance art? and anyone from New York’s downtown arts scene was surely familiar with them. One aspect of the New York School, broadly conceived, is the influence of Japan, China, India, and Tibet — not just in art, but in spiritual philosophy and practice. While the performance art scene includes some artists doing their impressions of shamanic rituals, it also includes some shamans whose authentic rituals converge with performance art — in the sense that their art is live, communal, participatory, and transformational. The Peace Concerts given by Sri Chinmoy fall into this category. They did not include only musical performance, but could also include live painting, poetry recitation, multimedia, and chanting of AUM in which the public was invited to participate. Even within the purely musical portion of the programme, the styles might vary widely from moment to moment — from the traditional to the unmistakably avant-garde, from a Bengali song sung a cappella in a style evoking the depths of India’s hoary past, to a peaceful melody played on Western flute, to an avant-garde piano improvisation with no foothold in melody or harmony, but only a dynamic flow of energy and consciousness. The works of the German philosopher Hans-Georg Gadamer (1900–2002) explain that ‘the modern concepts of science are not adequate to understand people and our experience of art and even communication.’ He developed a philosophical perspective in his work ‘Truth and Method’ and explained a process of philosophical hermeneutics. Since he’s a medical diagnostician, Clark tends to focus on the encounter between doctor and patient from which each ideally emerges with a fusion of horizons. But this concept can also be applied to the encounter between a shaman and those participating in the shamanic ritual; and to the encounter between a performance artist and audience-participants. The encounter seems to be a shared factor in precipitating the fusion of horizons, whether in the realm of medicine, shamanism, or the arts. As opposed to merely being mildly influenced by something in a controlled way, the Gadamerian concept of an encounter suggests a collision with the other from which one emerges changed, with a genuinely new synthesis of views. It’s primarily an encounter between American keyboardist Stu Goldberg and South Indian violinist L. Subramaniam. Both are listening intently to each other and communicating across a cultural divide, so that genuine fusion takes place. Within that fusion, each is expanding and contributing to the possibilities inherent in the other’s mode of expression. The result is something both ancient and modern, both Eastern and Western, both acoustic and electric; and in this fusion of horizons there’s a tremendous sense of liberation. Such fusion can be deeply moving and inspiring. When a small jazz group — for example, a trio or a quartet — performs, each musician has an assigned part that contributes to the overall coherence of the group as a whole. The drummer keeps the rhythm steady and solid. The bass player also has a key role in the rhythm section, working closely with the drummer and, in addition, providing the low-range contours of song’s harmony. The piano player fills in the harmonic details, providing a spectrum of chordal textures and colorings as well as harmonic extensions and superimpositions. The saxophonist interprets the melody, which, compared to the other parts, is what ‘connects’ most readily with the audience. When all of these parts come together well, a unified, not to mention aesthetically-pleasing whole results. Each player does more than simply play his or her part as an atomized individual. Instead, the individual musicians must perform in a constant mode of attentive listening in order to play as a unified group. If one player decides to stick rigidly to a rhythm pattern or a harmonic progression while the other members have collectively developed new patterns, then the cohesion of the group is diminished. Alternatively, the unity of the group is augmented when, for example, the saxophonist in a mode of attentive listening hears and responds to the pianist’s altered, superimposed harmonies and thus adjusts her solo accordingly. That is, as a skilled improviser listening empathetically she does not simply continue to play melodic lines that fit the original harmonic progression as if the former harmonies were the only proper way to play the tune; instead, she changes her lines to harmonize with the pianist’s new chordal colorings. By listening carefully to the pianist (the other), the saxophonist does not continue with her previous, as it were, ‘way of understanding’ the pianist’s horizon. Rather, she modifies her own horizon so that the pianist’s horizon is made intelligible and put in the best light. Given her broadened horizon, the pianist’s altered harmonies are not heard as mistakes — if they were, this would be analogous to forcing the other into one’s preconceived grid and thus distorting the other. Rather, a genuine understanding has been achieved through the communal creation of a new harmony analogous to a newly fused-horizon. Music is far more instructive than, say, a polarized political debate for understanding the fusion of horizons. In the typical political debate to which we are subjected, two politicians with fixed points of view slug it out, neither hearing the other or learning from the other, and neither being changed by the other’s point of view. But music by its very nature requires the cooperative skills described by Dr. Nielsen. Rather than treating the other as the enemy, a sensitive musician fuses with the other and counters in a manner which presents the other in the best light. 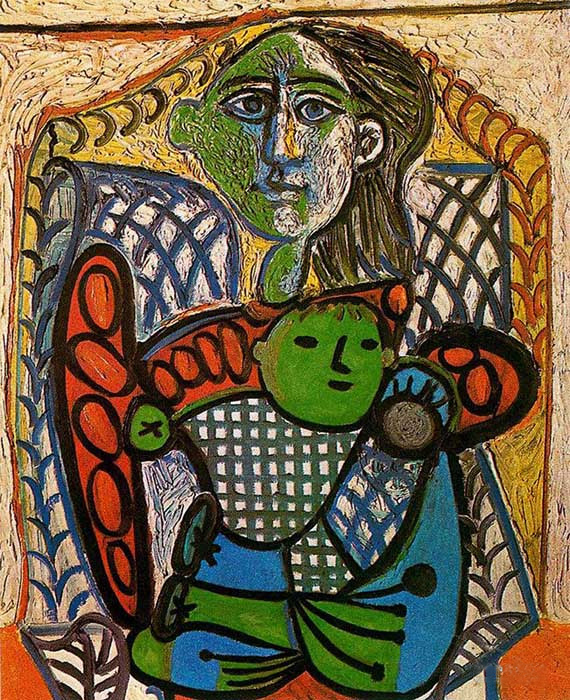 Gadamer can help us understand the fusion of horizons which took place between two major figures in twentieth century art: Picasso and Matisse. They were friends, yet rivals; and while this might initially seem contradictory or imply that no such fusion took place, the contradiction is resolved if we recognize that a fusion of horizons need not entail complete agreement or the abandonment of those aspects of the self which result in uniqueness and dynamic engagement with others. While the two faces are clearly stamped with the style of Picasso, the mixture of decorative patterns surrounding them loudly exclaims “Matisse!” Picasso has not lost his Picasso-ness; his encounter with Matisse has simply allowed him to express his own identity more richly. A Gadamerian analysis might also be applied to Sri Ramakrishna, the Indian avatar who passed away in 1886, but whose life and teachings formed the harbinger for the coming century in the West, in which the oneness of all religions became an idea seriously propounded, and by some, ernestly lived. Sri Ramakrishna was a natural inheritor of Hindu spiritual practices, but in his quest for truth he also spent time practicing Christianity and Islam, concluding that these too were valid pathways. Like the Neo-Vedanta philosophy of Sri Ramakrishna and his disciple Swami Vivekananda, Gadamer’s philosophical hermeneutics has a distinctly modern feel to it because it implies the abandonment of the fixed point of view clutched fiercely (and leading to strife or warfare). In its place, we are offered (as a people) the opportunity to engage in listening, dialogue and empathy, and to experience a fusion of horizons which allows us to understand what we had perhaps previously regarded with consternation, suspicion or hostility. In this sense, Gadamer’s approach is well-suited to the global village. It is recognized as anti-dogmatic in nature and humble in its awareness that the other’s viewpoint may be equally valid. It carves out a helpful middle ground between absolutism and relativism, holding out hope that through dialogue we might gain essential insights that would allow us to live together, respecting diversity without obliterating difference. Of course, a fusion of horizons is not embraced by everyone. In the field of religion, fundamentalism still afflicts some sects and causes them to violently reject the doctrine that Hindus, Muslims, Christians, and Jews are all worshipping the same God, and should therefore live in peace and harmony. Less violently expressed is chauvinism in the arts, but it can still be a divisive factor. Gadamer’s approach is surprisingly congruent with those spiritual philosophies which accept the doctrine of reincarnation or rebirth. As described in such philosophies, the purpose of rebirth is not to acquire scientifically objective knowledge, but to gather experience of life in all its contraries. We are (as Sri Chinmoy puts it) writing God’s autobiography, with the infinitude of possibilities that would imply. Nielsen says: “Because concepts, entities, and individuals stand in a complex interrelation with one another, they can be described from ‘nearly inexhaustible viewpoints’ (Wachterhauser 1999, 87). This complex interrelated net of relations into which all of reality is implicated gives rise to multiple perspectives and (legitimate) multiple and diverse meanings…” If so, it may take many rebirths to assimilate such multiple perspectives. Gadamer can help us make sense of a figure like Sri Chinmoy (if indeed any are like him), who may seem incomprehensible at first because he’s a spiritual teacher, but also an artist, poet, musician, and athlete. We understand such an astonishing polymath in part through openness and dialogue with his surviving works, and with the organizations he founded. We stop clutching our fixed point of view, and try to “disappear” into the music or the artworks, which possess the necessary magic (or yogic science) to teach us how to listen, view, and appreciate. 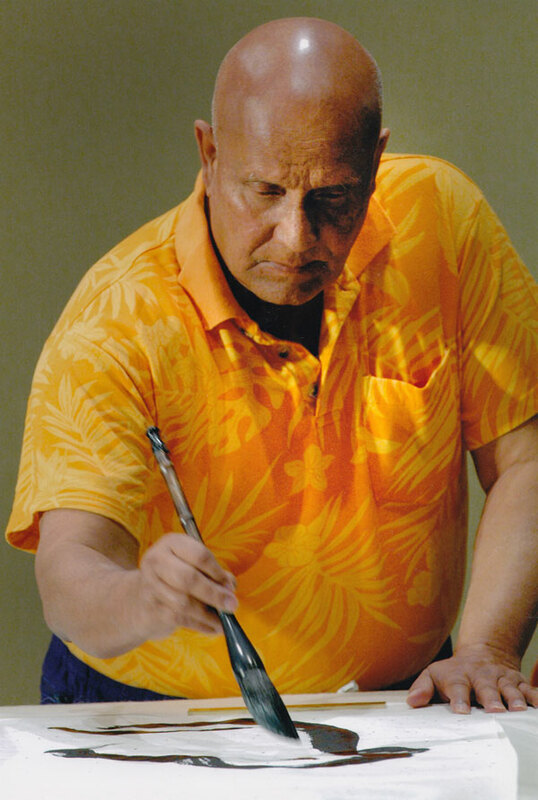 In his article “The Transformative Art of Sri Chinmoy,” Dr. Shrinivas Tilak tells the story of his own Gadamerian encounter with Sri Chinmoy’s art. He explores the relationship between the traditional poet-seer or “kavi,” and the modern performance artist. What’s especially fascinating is his suggestion that Sri Chinmoy straddles both categories. 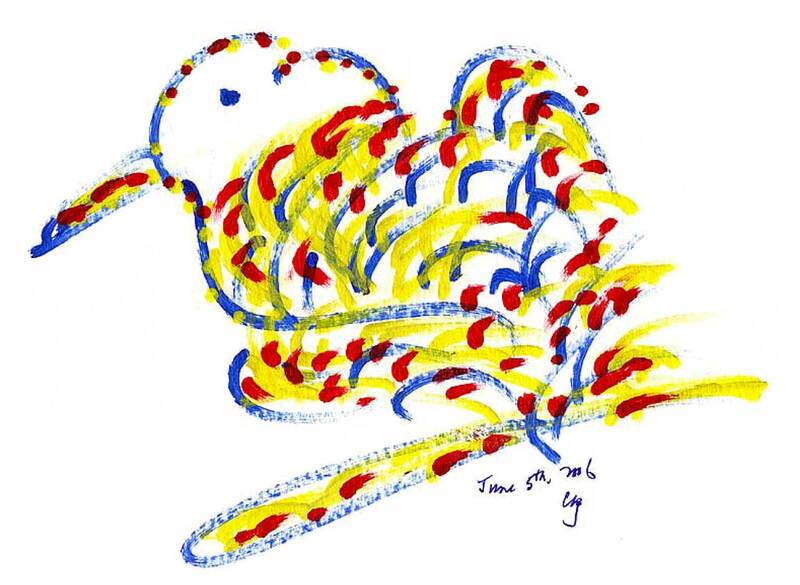 Here in Part 1 and Part 2 of “Art and Hermeneutics,” I’ve been laying the groundwork for “Put a Bird on It! Part 3,” where I hope to explore Sri Chinmoy’s art in relation to hermeneutics, shamanism, and performance art, with the help of Dr. Tilak’s article. I know I needed to write these preliminary articles in order to clarify my own thinking. I hope the reader will also find them useful. At around 15:09, McLaughlin discusses how he began to discover spirituality. He describes listening to John Coltrane’s album A Love Supreme, but not quite being able to grasp it. Still, he entered into a kind of Gadamerian dialogue with it. Having encountered music he didn’t understand, he looked for a text and found a poem on the back cover which gradually helped him zone in on what Coltrane was doing with his new style, which was deeply influenced by spirituality and meditation. As with Goldberg and Subramaniam, this collaboration between McLaughlin and Shankar shows how listening, dialogue, partnership and empathy can foster a fusion of horizons. Underscored too is the concept of “play” in Gadamer’s philosophical aesthetics. For Gadamer, play is not restricted to the creators of an art work. The viewers, listeners, spectators, or audience-participants are drawn into the play like attendees at a festival or participants in a ritual. Indian classical music is a far more participatory medium than Western classical music. In Indian classical music, the audience must count along with the musicians in order to understand what they are doing and appreciate the subtleties. After an extended passage of improvisation which plays with musical lines of different lengths, when the musicians and audience finally arrive together on the Sum, this is a deeply shared communal experience. The play of art will never be conceptually grasped; we may only participate in it to the extent that we allow ourselves to be moved by its magic. When we hear a musical work, we are at the same time inextricably invited to sing along and to dance. We cannot avoid an inner humming along, a tapping of fingers or foot, a following along, almost an accompanying “directing.” In any case, we play along when we hear music. The most authentic mode of execution for music is, therefore, to dance along. In just the same manner we recognize ourselves in a poem or painting; we are captivated by a novel or tragedy. It concerns us; it speaks to us. Gadamer’s thesis concerning the concept of play is that this going along with is not external to the work, but belongs to its statement: it is “art” only if there is this addressing. Every experience of art is one of answering to the address of the work. One exceptional feature of the duets played by McLaughlin and Shankar is found in the final piece which begins at 22:05 of the video. At 23:35, they break into konnakol, a form of vocal percussion which every student of Karnatic music learns as an aid to timing and rhythm. Because McLaughlin (raised on blues and jazz) has studied Indian music, and Shankar (raised on Indian music) has studied jazz, their play together reaches the level of genuine fusion of horizons. Dedication: I offer this post as a birthday tribute to Sri Chinmoy (1931-2007). A very happy 86th birthday to the master! In one sense, Sri Chinmoy’s art is the essence of simplicity; but the arts community (and especially art critics) sometimes prefer it when art is analyzed intellectually and placed in historical context. By the same token, Sri Chinmoy is in one sense completely unique. Yet, people who have a hard time understanding his art may benefit from viewing his bird drawings in relation to Chinese and Japanese calligraphy, and his abstract paintings in relation to the New York School (which got underway in the 1940s, but continued to evolve through the 70s and 80s). The late Paul Jenkins studied meditation and spiritual philosophy with Sri Chinmoy. Jenkins’s style of painting combining meditation and movement was certainly influenced by Sri Chinmoy. This is broadly characteristic of those New York School painters, poets, and composers who studied Eastern philosophy and incorporated it into their work. The art we seek to understand may be from another time or have different cultural roots, so in entering into friendly dialogue with it, we may discover the limits of our own knowledge. Hermeneutics is concerned with how we know what we think we know and what cultural assumptions we bring to the table. The dialogue between a spectator and a work of art may occur over a great historical and cultural distance. We can try to see a cave painting through the eyes of its creator, or we can view it through the lens of modernity; or we can look at it both ways — moving backwards and forwards in time to have a more fulfilling and illumining experience (no TARDIS required). 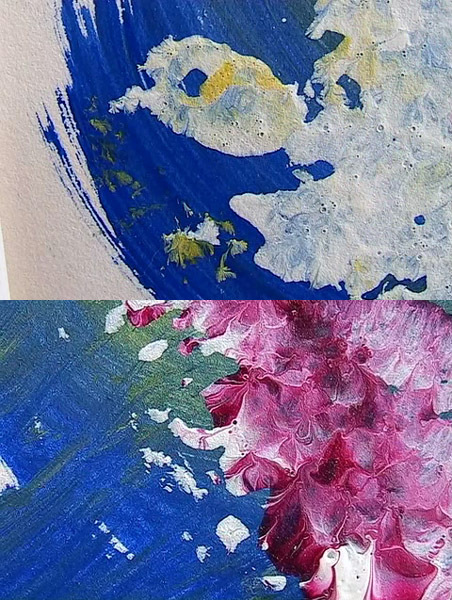 Brush strokes from an acrylic painting by Sri Chinmoy. Video by Kedar Misani. 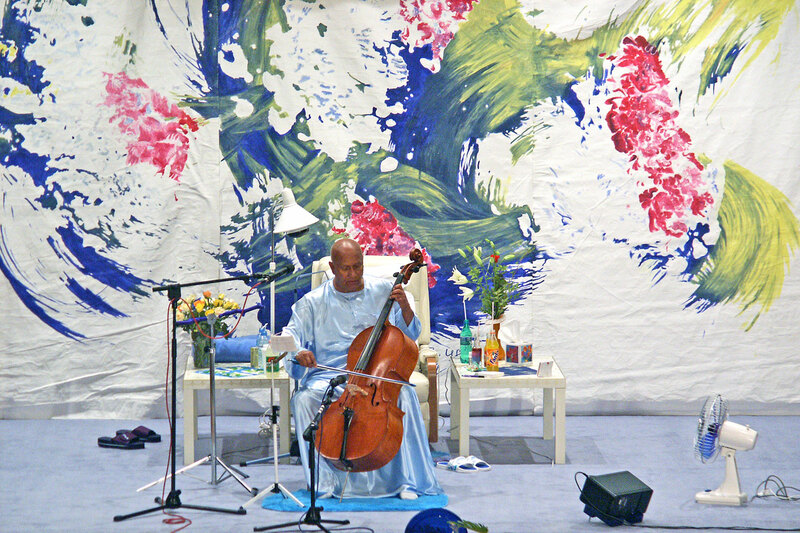 The same painting blown up and used as a stage backdrop for a concert in Switzerland. Photo by Apaguha Vesely. One might say that hermeneutics has two different but complementary functions: One is to help ensure that people’s interpretations of art are not merely whimsical, anecdotal, or based on personal or cultural bias. This a limiting function. The other is to foster a depthful connection with art based on dialogue, ideally leading to a fusion of horizons which comprises understanding. This is an expansive function. Still, hermeneutics is not a science; Gadamer said in a 1978 lecture that it’s a gift, like rhetoric, and that one of its components is empathy. Another feature of Gadamer’s hermeneutical aesthetics is the idea that both artist and spectator are involved in a form of play which brings people together in the manner of a festival. To understand a work of art is not to come away with a crib sheet summarizing its salient points, but rather to lose oneself in it (along with other spectators, perhaps from different times) and to be transformed by it. But this doesn’t signify an end to the game, since further revelations are always possible. Time flew by, and John felt sad that the beautiful butterfly disappeared into the sunset. These questions cannot be answered all in a day. When we immerse ourselves in a major work of art rich in symbolism, personal expression, cultural significance, and historical allusion, we are drawn into a hermeneutic circle which may be unique to that work of art, or to works of that genre. As we enter into dialogue with it, we ourselves may become part of the hermeneutic circle. When we say that the mind is not good, that the heart is better, we are speaking of the physical mind which does not allow us to expand ourselves. It always says, “One at a time, little by little, piece by piece.” The mind seems to go very fast, but you have to know that the mind thinks of only one thing at a time. It does not want to embrace existence as a whole. The mind sees things part by part. If Infinity appears before the mind, the mind will take a part out of the whole and say, “This is the truth.” It will take a portion of the Vast rather than accept the Vast in its own way. It will try to scrutinise Infinity itself to see if there is any imperfection in it. But the heart will not do that. As soon as the heart sees the Vast, it will run to it like a child runs to embrace his mother or father. — Sri Chinmoy, from Mind-Confusion and Heart-Illumination, Part 1, Agni Press, 1974. As a spiritual teacher, Sri Chinmoy taught the “path of the heart,” so it follows that his art would be heart-centred rather than mind-centred. This can pose a stumbling block for viewers and critics unwilling or unable to shift gears to a heart-centred mode of art appreciation. This kind of art may get short shrift from Western critics due to underlying bias in the art world. Hermeneutics actually helps us understand why such bias can occur. If a work of art tends to draw us into its own hermeneutic circle — its symbols, time period, cultural influences, and charismatic proponents (e.g. Andy Warhol) — then certain styles of art may give rise to particular communities or social cliques — some more glamorous than others. Critics who specialize in medieval and Renaissance art may be of quite different temperament and lifestyle than those who specialize in Pop art. Even in the same city, there can be an “uptown” and “downtown” arts scene. When asked whether he was a Mod or Rocker, Beatles drummer Ringo Starr replied that he was a Mocker. Since it was produced about fifty-five years ago, depending on our age and cultural experience, we may have a hard time making sense of it. We get that it’s cute and satirical, but we may not be quite sure which elements are satire and which are direct reportage. Did some people (the Beats or “beatniks”) really talk and act that way? Still, without catching every reference we probably sense the struggle between a free spirit who values expressiveness, and ossified structures which tend to penalize it. When invited to visit her friend’s dancing class on East 64th Street, little Suzuki explains that her parents Hugh and Marcia don’t believe in anything above 14th Street. Even in 1962, some folks living in Montana or Taipei might not grok that below 14th Street signifies Greenwich Village, an area homesteaded by Beat poets, artists, and musicians; while East 64th Street is part of the Upper East Side, an area with a quite different socio-economic feel. So what would people make of this charming cultural artifact, stumbling on it a thousand years hence? Would its essential spirit still shine through? The farther away we get in time and cultural distance, the harder it is for us to know whether jazz musicians in the forties really spoke that way, or what percentage of this lingo is being served up as satire. There may even be a racial (or racist) component. Are some of these white actors poking fun at black musicians, who are notably absent from the film? The piano player seems to be riffing on Fats Waller. When we first hear a Shakespeare play performed, we may not grasp the subtleties of language, and may miss the jokes (some of which turn out to be rather ribald). For the latter reason, Shakespeare texts used in primary schools are often expurgated. [A] work is something that is detached from its maker; even the craftsman is not sovereign over against his fabrications. The consumer of it: he can use it and abuse it; he can treat it correctly; he can destroy it quickly. If you decide to make the effort to read, when you read you will not deconstruct, but you would learn to construct. [T]he ideal of real, natural and not deformed hermeneutics is to disappear. Though he does not use such mystical language, I would guess he means that to become one with a work of art is to experience it directly, its essential nature, not filtered through one’s own conceptions or collection of experiences, but as it naturally exists. The inspiration behind a work of art struck the original artist, and it can strike us too. At that moment, we are egoless and have no opinions. We simply experience the essence of the thing. 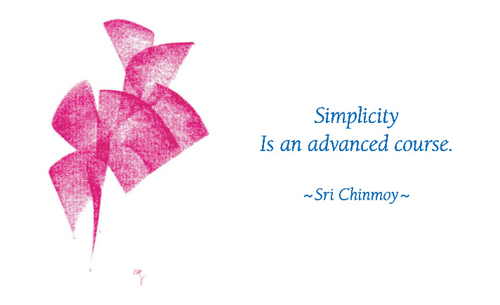 This is the ideal way to experience Sri Chinmoy’s art. In Part 2 of “Art and Hermeneutics,” I hope to tackle the connection between hermeneutics, performance art, and shamanism, and how this relates to the art, music, and poetry of Sri Chinmoy. Stay tuned. Some links may go bad over time, but I’ll try and keep them current. Are transcripts of Trump speeches accurate? Beware the cleanup of politicians’ speeches, as vital clues may be lost in translation. I’m not so compulsive as to keep a notebook on the subject, but I’ve often heard a politician make a speech and later checked the transcript only to find that their remarks had been cleaned up after the fact. Why should this matter? As a student of literature (and an amateur playwright), I know full well that the manner in which a character uses language (including any corruptions or malapropisms) tells us a lot about their background and influences. Those of us who spend years learning the craft of writing (and thinking) are keenly aware when someone mispronounces “nuclear” as “nucular,” or says “phenomena” (plural) when the case is singular. We cringe when we hear “squash” (which you might do to a bug) when what is really meant is “quash” (which you might do to a subpoena). We are not ideally snobs about it, but we tend to view how someone uses language as a vital clue about how they think. 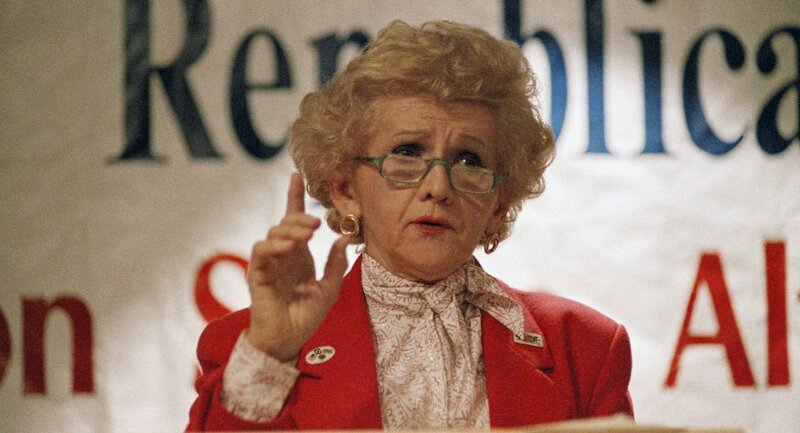 I remember back in the 1980s hearing Rep. Helen Bentley making a one-minute speech on the floor of the U.S. House of Representatives. She seemed quite disinterested, reading rather woodenly from something her staff had given her. It was supposed to be about a crucial issue concerning the Gulf Coast, but when she got to the nub of it she mistakenly said “golf course,” which I thought was a hoot. But of course, she got the standard “permission to revise and extend her remarks,” so the Congressional Record probably says “Gulf Coast,” nicely masking her absent-mindedness. 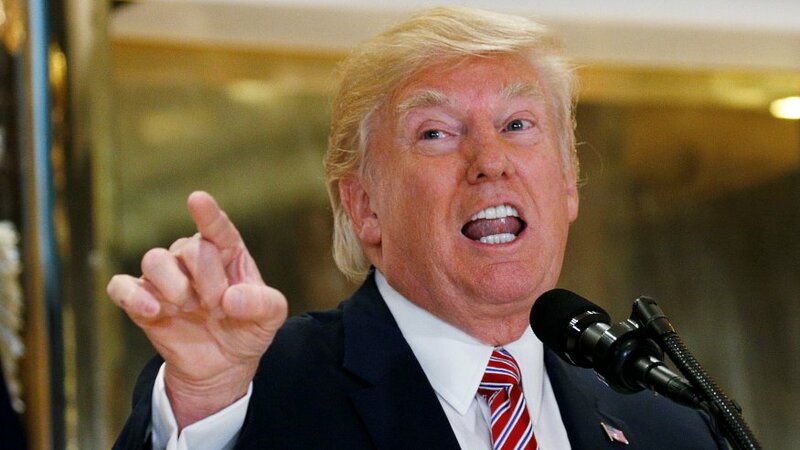 Bringing this into the Trump era, for better or worse I heard Trump’s speech on August 14 in which he was forced (seemingly at gunpoint) to denounce “the K.K.K., neo-Nazis, white supremists [sic] and other hate groups.” “Supremists” is at best a corruption, and at worst simply not a word. But in the transcript printed by The New York Times, he magically becomes grammatical! Helen Delich Bentley, who in her senior years as a congresswoman had trouble distinguishing between the Gulf Coast and the golf course, being perhaps more familiar with latter than the former. Donald John Trump, who on occasion may rail against “white supremists,” while at other times appearing to defend them. He had long ago made a pact with himself to postulate a Created Universe on even-numbered days, a tail-swallowing eternal-and-uncreated Universe on odd-numbered days — since each hypothesis, while equally paradoxical, neatly avoided the paradoxes of the other — with, of course, a day off each leap year for sheer solipsist debauchery. The debauchery might not be such a good idea, but there’s something to be said for taking life as seriously as you can, with occasional time out to laugh at its absurdities. As I’ve noted elsewhere, humour is helpful for relieving outrage fatigue. In between teeing off and praising the Veterans Tapdance Administration, Trump woodenly delivered an equivocal statement on Saturday — a statement that pleased no one except Steve Bannon, Stephen Miller, and Charlottesville Nazis. Ah, the times we live in! If Scaramucci felt even an ounce of genuine contrition, he would have taken a long vacation from public life, and spent the time cleaning outhouses or performing other works of public benefit. Instead, we’re treated to 15 minutes of his ugly mug on This Week with George Stephanopoulos. It is to weep — or laugh. Note: I’m using “Charlottesville Nazis” as a catch-all term here. Word is, most of the Nazis who demonstrated in Charlottesville came from out of town. Charlottesville has a reputation as a liberal college town with a diverse population and a welcoming atmosphere. UPDATE: CNN analysis of Trump’s latest (August 15) statement about Charlottesville, where he aggressively defends the alt-right. At 10:55 in the video, Van Jones breaks down in tears thinking of his Jewish godmother. No one is born hating another person because of the color of his skin, or his background, or his religion. People must learn to hate, and if they can learn to hate, they can be taught to love, for love comes more naturally to the human heart than its opposite. I am not truly free if I am taking away someone else’s freedom. One of the problems with Trump’s claim of moral equivalency between the two sides in Charlottesville is that the white supremacists and neo-Nazis seem very comfortable with a world where there’s slavery, fascism, and open carry of firearms, while the counter-demonstrators generally favour more freedom and less guns. They also managed not to commit vehicular womanslaughter. 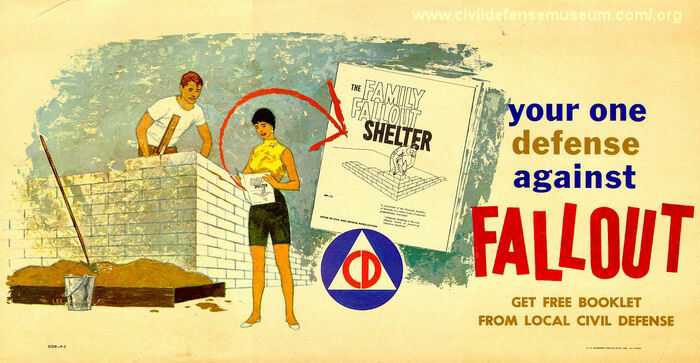 With the recent dramatic lack of brinksmanship by the Donald, people of Guam have needed a refresher course on what to do in case of nuclear attack. But have government brochures really provided adequate information? How do you protect yourself from fallout? A. Hide in the basement until it goes away. B. Wear protective rubber underwear, and simply brush yourself off at the end of the day. C. Run naked through a field of sorghum. After viewing the video, you should at least be able to answer this question: What is the most practical thing you can do in the event of a total thermonuclear war? Guam is not a state, but a U.S. protectorate. As such, it sends one delegate to the U.S. House of Representatives. The current delegate is Rep. Madeleine Bordallo, but according to tourists she’s not the only Bordallo in Guam. More Guam facts from The Colbert Report: Better Know a Protectorate. More Mystery Science Theater 3000: Rocket Attack U.S.A. on YouTube. By dawntreader72014  Posted in Humor, Politics	 Tagged #FireAndFury, civil defense, Colbert Report, Donald Trump, duck and cover, Guam facts, Guam threat, Madeleine Bordallo, mst3k, Mystery Science Theater 3000, North Korea nukes, nuclear fallout, Rocket Attack U.S.A.